Invalid or missing required value. 3. Start Migrating right away! 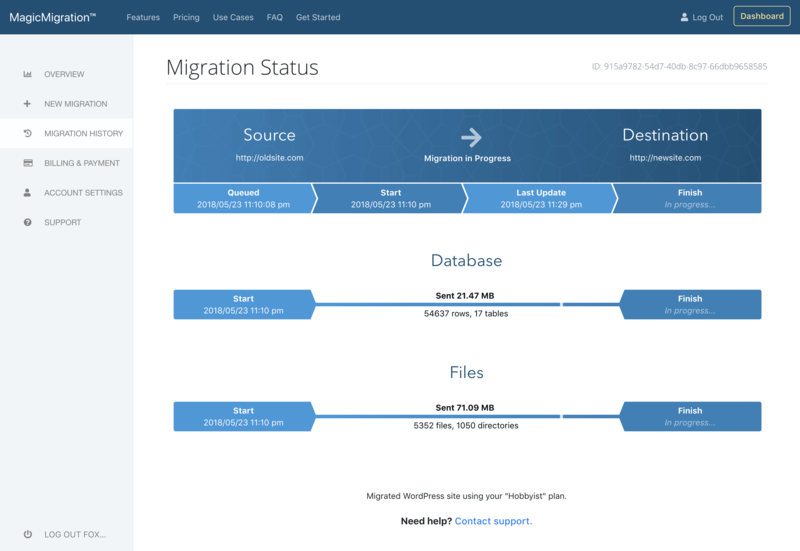 Automatically migrate your site's database & files while updating URLs, paths, serialized data, configuration files, & more. Advanced Options are available. Nothing to download or install so you can start migrating in minutes! Our automated magic runs on our servers, not yours, allowing it to play nicely with any server. Files, database, media, posts, pages, themes, plugins, configuration, etc. Optionally include non-WP data. Doesn't push hosting limits like disk I/O, memory, cpu, or runtime so it works great with practically any host. Copies files, database, configuration files, media, posts, pages, and more while updating URLs and paths. Easily move to a new server, domain, subdomain, subdirectory, or entirely new URL. It's completely flexible. Database settings, paths, and more are auto-detected to make migration simple. It's easy for anyone. If using cPanel provide your login then your site, database, & ftp will automatically be set up like magic! The magic runs on our servers, not yours, so there's nothing to download or install. Say goodbye to finicky configurations or plugin conflicts. On a hotspot, hotel wifi, an airplane, or have a data cap? Your site is transferred using our bandwidth so your data plan & battery are spared. Shared, dedicated, VPS, fast, or slow as molasses. All that's needed is a connection to the database (eg. mysql, MariaDB) and files (eg. ftp, ftps, sftp). Our solution won't slow down your site. Hosting limits like disk I/O, memory, cpu, or runtime aren't pushed so your site keeps running smooth. * Sites hosted on platforms blocking file and/or database access, such as wordpress.com, cannot be migrated. Most hosts do not block this access. You don't have to be locked into your current web host. Whether your current host's performance has gone down or a competitor's prices are better you can easily switch over to a new host. You can even do this to test out a new host before making the final decision. With the help of your hosts file you can preview your site at the live URL before directing all internet users over to the new server. A great way to get started on a new site is to clone an existing one and then make changes from there. For example, many or our WordPress users have a standard base site with the basic plugins and settings pre-configured the typical way they like and then when it's time to make a new site they clone it to a new server or URL. It's best practice to develop and work on a non-live version of your site. Demo an in-progress site to a client on a development site and then once everything is just how you want it migrate it to the live location. Many users work with three sites for their workflow: Development (where you make your changes), Staging (where you demo your changes to clients), and Production (the live site visitors see). Servers running cPanel, which is included with most shared hosting plans, can enjoy even easier migrations. By providing your cPanel login all server settings will be automatically detecting allowing the migration to run without entering any file or database server settings. Easy migrations! By default everything is kept simple and automated. However, power users may choose to override any automated settings for full control over any part of the process. This includes custom file access settings, database settings, and WordPress-specific configuration options. Receive news, announcements, and discounts. © 2019 AngryPancakes LLC. All Rights Reserved.